The Darke County Friends of the Shelter donated 22 Wag’N 02 Fur Life Pet Oxygen Mask Kits to 10 EMS and 12 fire departments in Darke County. GREENVILLE – Pets in Darke County now have a better chance of surviving a fire thanks to the Darke County Friends of the Shelter. 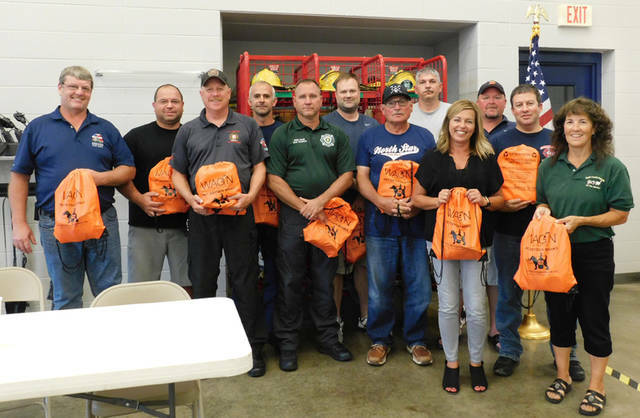 The Darke County Friends of the Shelter recently donated 22 Wag’N 02 Fur Life Pet Oxygen Mask Kits to 10 EMS and 12 fire departments in Darke County. Each kit includes three oxygen masks of differing sizes, oxygen tubing, a leash and laminated instruction sheet in a bright orange bag. As most pet owners leave their furry companions home alone when they go to work, pets are left to fend for themselves in the event of a house fire. Far too many pets die each year of smoke asphyxiation because EMS and/or fire departments do not have the proper equipment to revive them, Darke County Friends of the Shelter officials said. All Darke County services now have the Wag’N 02 Fur Life Pet Oxygen Mask Kit, which can be used on both conscious pets and on pets that need to be resuscitated. With the three different sized reusable masks animals of varying sizes can be saved. To most people, pets are considered part of the family and the Darke County Friends of the Shelter is proud to honor the companion animals in the community by keeping them healthy, happy and safe, officials said.